Our estate Margarita Vineyard occupies one of the Paso Robles region’s coolest growing environments, but it sure didn’t feel that way over the past weekend during a heat wave that swept across the West Coast. Temperatures reached 105 degrees at Margarita Vineyard. In other areas of the region, temperatures reached 111 degrees. Thankfully, things are now starting to cool back down. As we always do when extreme heat is predicted, we took preemptive action to minimize potential damage. Four days before the high temperatures arrived, we started irrigating more steadily to ensure sufficient vine hydration. We also ceased all leaf removal activities to ensure that the fruit wasn’t overly exposed to hot direct sunlight. As a result, we avoided sunburn of the grape skins, as evident in the accompanying photo taken yesterday of a young Zinfandel cluster. 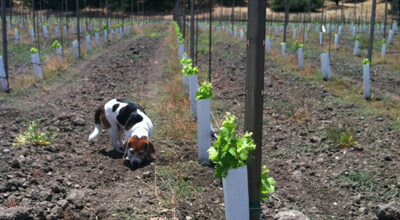 Even our vulnerable new Merlot plantings (pictured below) are still sitting pretty without any leaf burn. It helps that this heat wave came relatively early in the growing season. When the grapes are small and green, the skins are thicker and tougher. 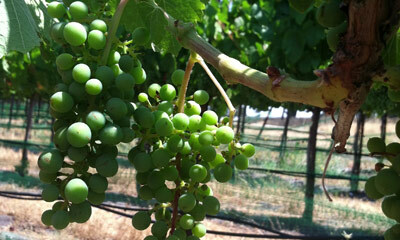 High heat can be more problematic later in the season, when the fruit is ripe and skins are more delicate. It’s hard to fathom that exactly one month earlier we were experiencing freezing morning temperatures at Margarita Vineyard. Such is the adventure of agriculture, and whether it’s hot or cold or in between, we always need to be on our game and keep our cool.